There is one garden chore that I am ambivalent about. This is my very long, wrap around, laurel hedge (Prunus laurocerasus). I have been pruning it since 1986. In 1992 I decided to achieve the "Holy Grail" of pruning by using only secateurs (above right). It took me a week. Since then I have found that if I do it now I only have to do it once in the year. I don't use electric hedge clippers as they don't cut off all the leaves or some of the thicker stems. These yellow in a few weeks and the hedge is unsightly. I use hand hedge clippers, which this year I had sharpened. It will take two days of this Victoria Day weekend. In the mid 1990s my neighbourhood was in flux. Older people who had gardened for years sold their houses which were then torn down to be replaced by bigger houses with smaller gardens that were supposed to be maintenance free. In those days contractors did not understand the value of the old plants in the gardens so I was able to remove many of them (with the contractors' blessing)and bring them home in a wheel barrow. There are many plants in my garden that remind me of the houses they came from or of the people who lived in them. I have a spirea from the garden across the street, where Mrs. Alm used to live. In hot summers, when the crows would make noise during her siesta, Mrs. Alm would come out and clap in a futile gesture as the crows never paid attention to her. My first hosta ever, a huge green one, came from a house on 43 Avenue and Hudson that had one of the most beautiful blue spruces I had ever seen. Since I have never found out its cultivar name of the hosta (probably Hosta 'Elata') I have always called it Hosta '43d & Hudson' For about 5 years an orange and red rose from Cartier Street had the name Rosa 'Cartier' until one day Brad Jalbert (from Select Roses in Langley) identified it as Rosa 'All That Jazz'. Rosemary has come to love it in spite of its lurid orange/red colour. Rebecca wants one. 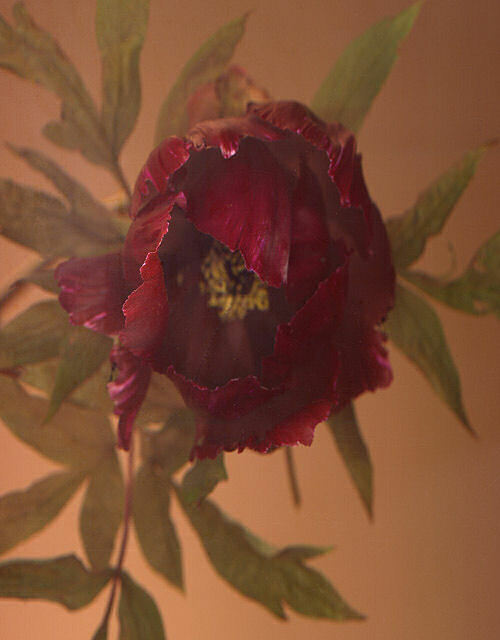 But one of the mystery guests of my garden is a peony tree that has very fragrant and large dark red flowers with white streaks. I know nothing about peonies so I have never identified it. In good years we got one to three blooms. A couple of years ago we had to remove a dying juniper hedge from the lane wall and since there is now a lot more sun coming in, the mystery peony is in full bloom today. I counted 12 flowers. Rhododendron luteum was first described by Linneus in 1753 as Azalea lutea because of its yellow flowers. Recently azaleas, formerly thought to be first cousins of rhododendrons, have entered as full fledged rhododendrons and are no longer called azaleas. 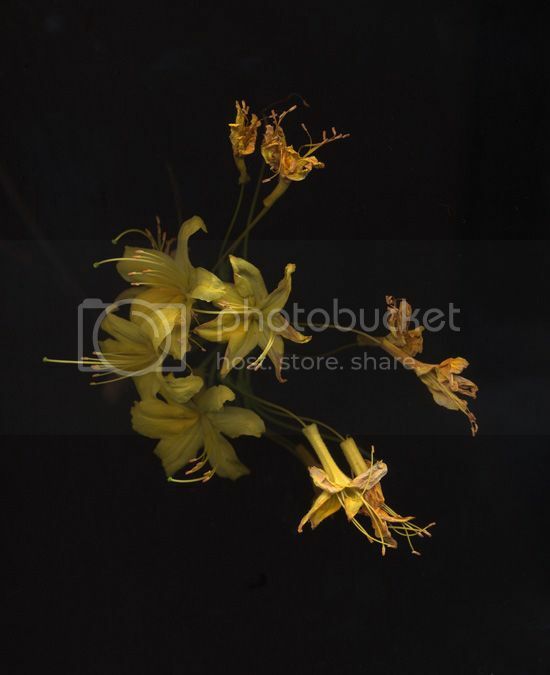 This scan of the flowers of the Rhododendron luteum from my garden show some spent flowers. I am showing them for a reason. The large tree-like bush (large because I calculate that my specimen must be 40 years old) begins to bloom around May 6 but by May 16 many of the flowers begin to wither. It is at this stage when the unusually sweet scent of luteum becomes even more so. The combination of a hot evening and the overipeness of the flowers is one of the spring pleasures of my garden. It was 1917 in Manila. About a month before my mother Nena had her birthday (she was going to be 6), her father, Don Tirso de Irureta Goyena took her to a toy store. They looked around and my mother eyed a beautiful doll house but said nothing. A few days before her birthday my grandfather died. He was 35. The day of Nena's birthday a messenger arrived with a big package for Nena. Nena opened it to find the beautiful doll house. In it was a card that said ,"To my daughter on her birthday from your loving father. Tirso. " My mother got up and shouted in with pleasure, "Papi is not dead. He just sent me a present." As a little boy I had a toy sailing boat that was about 4ft long. My father gave it to me and I have fond memories of floating it around in ponds in Buenos Aires parks. I have no memory as to when it disappeared from my life. This week I took Rebecca to a development on Beach Avenue that has a pond. I borrowed a boat from architect Dale Rickard. Rebecca fell in love with the boat and said, "Suppose he gives me the boat?" I said that it wasn't going to happen as it is an antique. But there is no doubt in my mind what I have to get for Rebecca on her birthday in August. 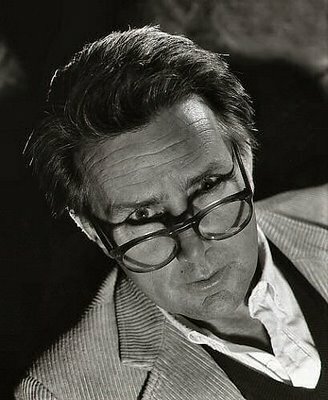 I met and photographed Martin Sheeen in October of 1988. He was in town to promote a thriller film called Coldfront. I remember that after the press conference he was surrounded by many journalists and I did not know how to isolate him from the crowd for a photograph. To make things worse in 1988 I was heavy into shooting with a spotlight and it was a cumbersome piece of equipment. So I faced Sheen and told him in Spanish, "¿Podria bajar sus gafas?" I used the castillian word for glasses "gafas" and I asked him to lower them. I knew that Sheen spoke perfect Spanish. He was so surprised to hear my Spanish that he stopped to pose for me. I got the glasses to cast shadows on his eyes exactly where I wanted. There are two films that are my favourite Sheen movies. Everybody knows about his role as Captain Benjamin Willard in Apocalpypse Now but few know that he was First Lt. Dobbs in Catch-22. I watch little TV so I have never seen the West Wing that aired its final episode this week. But I know that somehow Sheen picks his roles based less on the idea of how much money he can make and more on a character that has integrity, a virtue he seems to have in spades. On April 8 I listened to Russian pianist Nikolai Maloff play Beethoven's Piano Concerto No. 1 Opus 15 C Major with the Vancouver Philharmonic Orchestra. I was five ft away and from my perspective I thought the piano was soon to collapse. My instincts were based on the fact that I had seen him work on the piano the day before. I had attended the dress rehearsal with my wife Rosemary and granddaughter Rebecca. During a moment, when the cellos were not playing, I watched one of the players play "air" piano with a smile on her face. I was surprised to see Jane Coop in the audience. She told me that Maloff was in her UBC piano program and that indeed he was as good a pianist as I thought. Sunday I listened to a taped recording of a January 22, CBC Radio Two Westcoast Performance, hosted by Michael Juk. The program featured Daniel Chow on the piano. Early on Chow played Felix Mendelssohn's Allegro brilliant in A, Op. 92 for four hands. Chow played with a mystery partner whose initials Juk informed us were JC. The mysterious pianist was Jane Coop. It seems Chow had lots of fun playing the piano with her. But it was his interpretation of the Bach / Busoni - Chaconne (from Partita no.2 in D minor for violin), BWV 1004 that made the hair on my arm stand up. 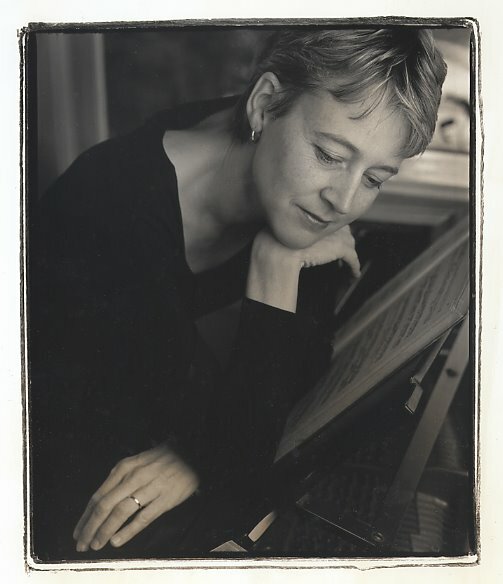 I have a live performance of the Chaconne by Monica Huggett on baroque violin. I found Chow's version (also live and recorded in CBC's Studio One) no less "religious". For at least 13 years, I have been going to the UBC Botanical Garden Mother's Day Plant Sale. It opens at 10 am but I line up around 7:45 so I can be in the front of the line and I have a good chance of getting the plants I want. 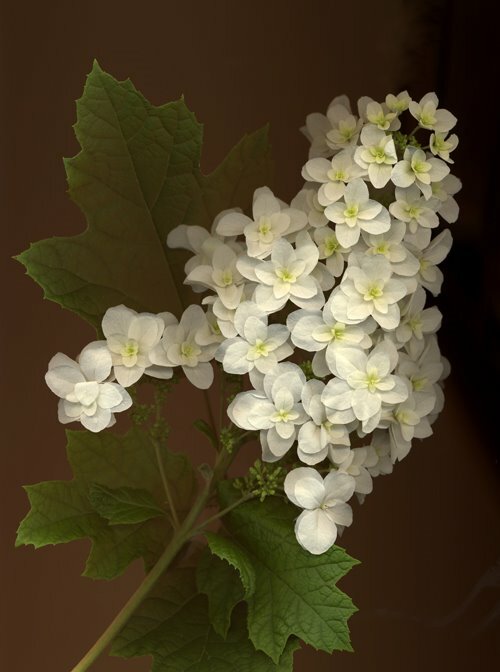 This year, if things go as planned, I will be returning home with Hydrangea involucrata 'Hortensis'. This is a rare hydrangea cultivar rarely offered in the plant trade. I may have around 25 varieties of hydranges in my garden and I am most proud of Hydrangea serratifolia which is a species from Chile. I have a fondness for hydrangeas because they are the plants of my youth in Buenos Aires. Since Buenos Aires is in a similar latitude to South Africa many of the plants that grow in South Africa grow in Buenos Aires. Here in Vancouver it is warm enough that we can grow most hydrangea species. In my garden they can thrive in deep shade. Not mentioned in most plant books is the fact that many hydrangeas are fragrant and smell of honey. This is the case with Hydrangea quercifolia 'Snowflake'( a double flowered sport, above) which is from a species that thrives in the US South. As long as hydrangeas get lots of moisture during the growing season (no problem in Vancouver) they are carefree as they are not affected by pests. Unlike with roses, pruning these plants is very easy. Quercifolia means literally "like an oak leaf". Quercus is Latin for oak.